Digital marketing is the product of the internet. The more internet is grooming and spending all over the world; digital marketers are finding new ways to reach out the masses. With the huge success, many businesses are turning towards the digital marketing tools due to its various features and the options it provides. Digital marketing is entirely different from the traditional marketing. However, the theories of marketing are same, but its implication varies. That is why it is important for the young marketers to get the command on digital marketing tools because this is the future of marketing and advertisement. 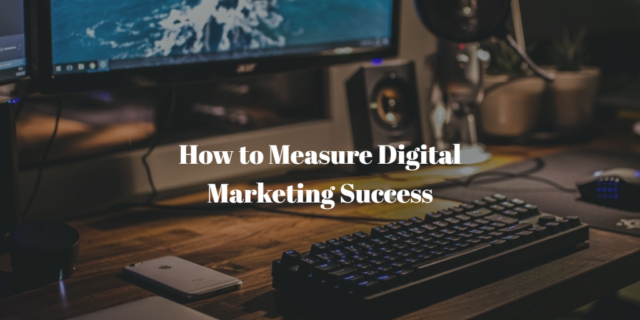 Following are the steps through which you can measure your digital marketing success. As I mentioned above, to analyze the high and low of the businesses, it is important to know about the risk and return. First, you have to establish what sort of risk you want to take or how big you want to set your business objectives. The clarity of your business objectives is important in aligning your employees from top to down management and executives’ level. This alignment is important to achieve the goal because then the entire team will remain on the same page. At one point, you could make your goals in the broader perspective and can narrow it down afterward according to the scenarios and conditions. However, thorough research, brainstorming and by taking suggestions from your board of advice, it is important to make realistic goals and then put your all effort to achieve it. That will help your marketing team to run a campaign which would be designed accordingly to your goals. Once you have built your business objectives means you have taken the risk, now it is time to calculate the return or conversions of your digital marketing. Conversions happen when the visitor or consumer takes the action which you want to make them through your digital marketing campaigns. Conversions are directed towards the sales, revenues, and profits. Following are the types of conversions that can evaluate your digital marketing. Online Sales: This is the beauty of digital marketing. This is the only genre of marketing in which you can track your sales. Moreover, this is the simplest way to track your success. If your business owns any website or social media page, being a digital marketer you have an entire authority of tracking every transaction from the card of the buyer. You can even track the geographical position of the customers and can build your future marketing campaigns according to it. To make it easier, there are many tools available on the internet, and the best one is Google’s own Google Analytics. With the Google Analytics, you will not only be able to see which campaign is driving more traffic for you, but you can also track the pages from which the visitor is landing on your website. Online-to-store Sales: You can get or have the clients who only do digital marketing but do the physical business means they have their own store on the streets. Then in such conditions how can you track the conversions? Don’t worry! The pundits of digital marketers also have the solutions for it. You can run many campaigns to track the sales. For example, you can run a campaign in which you would collect the information like name and email id of your potential customers on your website. Later you can use this information to compare with the cash register on the shop. Another campaign which almost every veteran marketer suggest is to offer a special discount promo on your website, so whenever the customer redeems it on the shop, you will get notified instantly. Accounting assignment help, you can use all this data to calculate the marketing budget and the sales generated through it. Web Forms Leads: Web forms are also a source of reaching the customers. Instead of driving them towards your social media page or the website, you can ask them to fill a web form to get your services. With these forms, the customers cannot only buy or hire your product or service, but the customer can also schedule appointments or can ask for the information about your business or product. The consumer who fills this form can be converted into your customer and would be an ideal one to track because you have his complete detail in the web form. Money is not the only reason of failure and success of any digital marketing campaign. This part more towards engagement and traffic generations instead of profit making. This is solely for those digital marketers who have the client who runs their own business through the website only or have own a web based business. Your website is your shop and you can track each and every customer through it. Following are the ways through which you can track your digital marketing success. Website Visits: this is the simplest step of tracking your digital campaign. You just have to see which one of your ad or keyword is sending traffic towards your website. In order to track this, you have to take the help of Google Analytics. Google Analytics will give you detailed numbers about each campaign that you have run, and you can judge the performance of any ad you posted on the basis of those numbers. Sessions: the meaning of session in digital marketing is different from its literary meaning. From one click to another or the time of moving from one page to another is called session. This is one of the most important thing considered in the digital marketing because it shows that the visitor of your website is showing interest in your website and he is a potentially strong customer of yours. Pay close attention to the page on which the visitor is spending his time most. Analyze from which channel the visitor is landed on that page and count your paid ad and other investment and tally it with the success of your digital marketing campaign. Bouncing Rates: from all the rates, increase in bouncing rate is the worst thing a digital marketer can expect. It creates negative impacts on your digital marketing strategy. If any of your ads is getting the clicks but people are hitting the back button by landing on the page, then this means there is a big disconnection between your ad and in your landing page. The reason behind it could be your ad not portraying the exact thing which is your landing page for or the landing page is not according to your ad. For this, you first should oversee your ad’s copy, visual or placement. If it is according to the business and as it is supposed to, then you should ask the developer to do the necessary changes in the page to make it according to your ad, so the visitor who lands on the page get the same thing which he was looking for. It is good that your digital marketing campaigns are succeeding and the clients are happy with you but it is also important to know the reasons for its success. It is equally important to know the reason of the failure of your marketing campaigns too so you can improve your campaigns in the future. If you have anything to add in my above content, do share it with us in the comment box and I will try to hit you back as soon as possible. Kevin Peterson is a Master in Marketing from the University of Birmingham and currently doing the digital marketing of some biggest brand of the UK. He is also a very smart and creative writer and also provides Best Assignment Help Company for the students in need.